The printing depends on the smooth flow of ink, which can be hindered if the ink begins to dry at the print head, as can happen when an ink level becomes low. 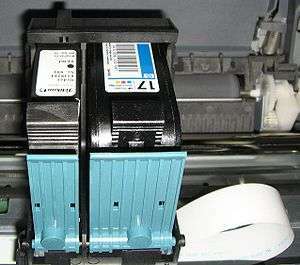 Dried ink can be cleaned from a cartridge print head using isopropyl alcohol or water. 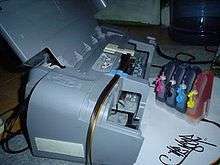 Isopropyl alcohol will damage the printing head, melting the plastic at the connections and rubber gaskets. Tap water contains contaminants that may clog the print head, so distilled water and a lint-free cloth is recommended. Consumers can refill ink cartridges themselves with a kit, or they can take the cartridge to a refiller or remanufacturer where ink is pumped back into the cartridge. PC World reports that refilled cartridges have higher failure rates, print fewer pages than new cartridges, and demonstrate more on-page problems like streaking, curling, and color bleed. Laser toner or inkjet cartridges sold as "remanufactured" are usually re-filled cartridges, although many third party newly manufactured "compatible" cartridges exist. Inkjet cartridges sold as "compatible" are typically newly manufactured cartridges. Inkjet cartridges sold as "remanufactured" are cartridges that have been used at least once by a consumer and then refilled by a third party. The legality of this industry was brought to the United States Court of Appeals for the Sixth Circuit in the case of Lexmark Int'l v. Static Control Components. The Court ruled that reverse-engineering the handshaking procedure to enable compatibility did not violate the Digital Millennium Copyright Act. ↑ Fang, Mei (12 April 2010). "How Is Inkjet Printing Done?". Science 2.0. ION Publications LLC. Retrieved 2015-06-16. ↑ "Clean Your Print Heads". www.castleink.com. Castle Ink. Retrieved 2015-06-16. ↑ "HP Deskjet Printers - Cleaning and Maintaining the Printer | HP® Support". support.hp.com. HP. Retrieved 2015-06-16. ↑ "How To Extend the Life of Your Cartridge". Lexmark Printers. 7 Jan 2008. Retrieved 2015-06-16. ↑ Hanson, Eric. "imaging.org - Online". www.imaging.org. Society for Imaging Science and Technology. Retrieved 2015-06-16. ↑ "The high cost of wasted printer ink". Consumer Reports. June 2013. ↑ Edwards, Cliff (28 May 2009). "HP Gets Tough on Ink Counterfeiters". BloombergView. Bloomberg L.P. Retrieved 2015-06-16. ↑ "FAQ". www.ink-system.co.uk. INKSYSTEM®. Retrieved 2015-06-16. ↑ "L100 & L200 High-Capacity Ink Tank Inkjet Printers - Milestone Products - Epson". global.epson.com. October 2010. Retrieved 2015-06-16. ↑ "ACRA v. Lexmark". Electronic Frontier Foundation. Retrieved 2015-06-16. ↑ "Printers: Refills or new cartridges?". PCWorld.ca. 2007-04-03. Archived from the original on 2007-06-05. Retrieved 2009-07-22. ↑ "Information on refillable cartridges with auto reset chip". Ecbinkjet.com.au. Retrieved 2009-07-22. ↑ Whitney, Lance (2010-03-18). "HP settles inkjet cartridge patent complaints". cnet.com. Retrieved 2010-09-13. Wikimedia Commons has media related to Ink-jet cartridge.